A police male voice choir is changing its name and distancing itself from its force after being told it went against equal opportunities policies. 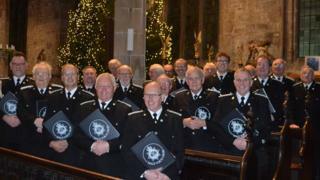 Derbyshire Constabulary Male Voice Choir was asked to become a mixed-voice group in September last year.But chairman Kevin Griffiths said it would be "difficult" to hire the 50 women needed to balance the sound.Derbyshire Police chief constable Peter Goodman said the group was "incompatible" with force policies.Earlier this week, Derbyshire was announced as the force with the largest gender pay gap in the country. Mr Griffiths said the group met with the chief constable in January to discuss the issue, but was given a notice in March saying authorisation to use the force in its name had been revoked. "We fully understand the rationale behind Mr Goodman's decision," he said. "We are very good at what we do, and to undertake such a change [becoming a mixed choir] would have required the recruitment of up to 50 new female members with a host of associated costs. "We felt that to attempt such a change would have destroyed the choir and felt it was better to sever our association with the constabulary and continue the good work we do under a new name. "Mr Griffiths added that no women had asked to become members of the choir in its history. "[Our members] sing in mixed choirs, and we enjoy it, but there's just something about a male voice choir," he said.Mr Goodman said his force is "an equal opportunities employer" and "committed to having an organisation where there are no enclaves where people from different backgrounds cannot go". "I wish [the choir] all the very best for the future," he added.